The Therizinosaur (thair-uh-ZEEN-uh-SAWR) is one of the Dinosaurs in ARK: Survival Evolved. I'm not entirely sure how Therizinosaurus multiensis stays populated on the Island. It is surprisingly slow for its size, and is a solitary predator (so no pack to back it up). I suppose the fact that its sheer power rivals Tyrannosaurus is the only thing that allows this very aggressive medium-sized predator to thrive. The claws of Therizinosaurus are some of the most versatile biological tools I've encountered, as adept at removing trees and foliage from Therizinosaurus' path as they are at piercing the thick shells and hide of the Island's most defensive creatures if backed into a fight. A tamed Therizinosaurus is one of the most versatile mounts a survivor can have. It can be trained to use its claws brutally or delicately, allowing the rider to primarily harvest with enhanced efficiency the specific kinds of resources that he or she needs. And in combat, these same claws can pierce straight through the toughest armor. This flexibility more than makes up for its inability to carry the large loads of the Island's many herbivorous beasts of burden. Therizinosaurus can be found wandering around alone, though it is not uncommon to see them in small groups of 2 or 3. Whilst they tend to ignore other creatures in the area, any predators, players or tamed creatures that venture too close will envoke an aggressive response. Caution is strongly advised! 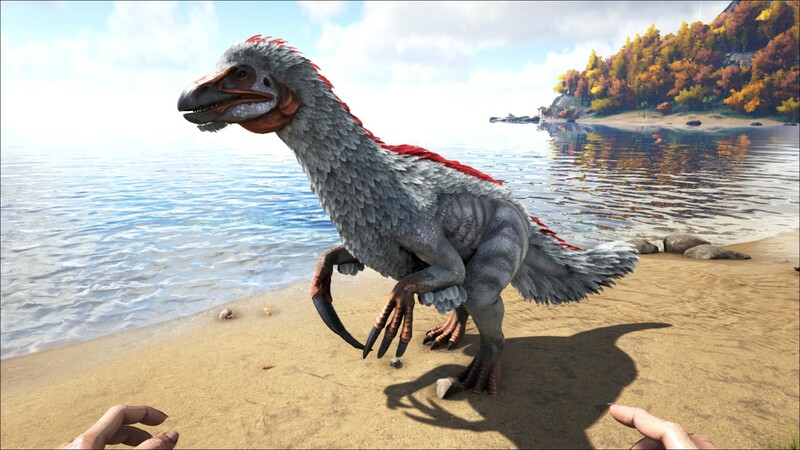 A Therizinosaurus is one of the strangest creatures a survivor will encounter on the island. Although it is built like a Tyrannosaurus or an Allosaurus, and despite the dossier calling it a predator, the creature is a herbivore, using its scythe-like claws to pull down leafy vegetation for consumption. The massive claws are just as efficient for slashing foes in combat though, intimidating all but the hungriest of predators. The beast is also covered in a thick covering of feathers much like its real life counterpart: Therizinosaurus cheloniformis. This section displays the Therizinosaur's natural colors and regions. For demonstration, the regions below are colored red over an albino Therizinosaur. The colored squares shown underneath each region's description are the colors that the Therizinosaur will randomly spawn with to provide an overall range of its natural color scheme. Hover your cursor over a color to display its name and ID. For example, "cheat SetTargetDinoColor 0 6" would color the Therizinosaur's "feathers" magenta. Using the (PC), (PS4), (Xbox One), the Therizinosaur slashes at the target for considerable damage. When harvesting trees, this attack will only collect Wood and Thatch. Using the (PC), (PS4), (Xbox One), the Therizinosaur shears nearby flora with its claws. When harvesting, it cannot hit trees, and from bushes it will only collect Fiber. This attack inflicts Torpor at 0.5x the damage dealt to affected creatures. Using C (PC), (PS4), (Xbox One), the Therizinosaur bites at the target. When harvesting, it cannot hit trees, and from bushes it will only collect Berries, Seeds, and Rare Flowers. This attack inflicts Torpor at 0.5x the damage dealt to affected creatures. Since 253.3 the bug (Fertilized Megalosaurus Egg) is fixed and the Therizinosaurus now prefers Kibble (Megalosaurus Egg). Note, the kibble fills up 120 food per bite, not 80. As Stimberries do not recover Food, the AI will detect that it is still hungry after eating and trigger a continuous cycle of consumption. Stimulants do not work nor will using Remote Use speed up the process. The Taming Effectiveness gained using Stimberries is exceptionally poor, due to the thousands required to tame. However, Stimberries that are consumed autonomously do not seem to affect Torpor, meaning it will not wake up any faster. (As of 253.5 this no longer works) This loss can be counteracted by allowing the creature to wake up when it's close to 0 Food and then knock it out again, resetting its current Taming Affinity and Taming Effectiveness, but preserving its current Food. At this point, do not use Stimberries. This section describes how to fight against the Therizinosaurus. The Therizino is capable of dealing a large amount of DPS, and deals some torpor for each attack and has quite an effective attack range. Therizinos are highly aggressive for Herbivores and will not hesitate to attack any players or tames that approach too closely. Keep in mind that although it isn't as flashy or impressive looking as a Rex, it is at least as powerful as an Allo and not to be taken lightly. It is not recommended to take a Therizino head on with a tame unless you are certain it can take a beating, and certainly don't attempt melee with one if unmounted as they are quite capable of shredding armour very quickly. Fast mounts, high perches and ranged weapons are the order of the day. Shotgun works well if aimed at the head. Four rounds may down it from close range, depending on server settings, level, quality of gun, etc. The Therizinosaurus' attacks are capable of damaging both mounts and their riders in a single attack whenever it randomly uses its bite attack - although the rider must still be in range of the attack. Approaching a Therizinosaurus with shorter mounts is not advised as they can distribute Torpor to the rider of a mount when hit by the bite attack. Therizinosaurus can aggro on a player inside a house if they wander too close, potentially tearing down anything not made of metal, so it's best to monitor the location of any that wander nearby. It's worth noting that due to the shared torpor effect, the Therizinosaurus can knock a player off their mount unconscious. It can't heal well like the Rex, unless using sweet vegetable cake. Attacking behind spikes with a pike can allow you to kill one on foot, as its head will pop over and they won't be able to hit you. Also, it seems to have a fear of deep water - even if you are shooting it it won’t enter it. Obviously a crossbow or raft is required if you can’t shoot it from the other side of a lake. and other Therizinosaurs); unless the Survivor is on a tamed Therizinosaur and get too close to larger carnivores like the Yutyrannus. Each of the Therizino's attacks hits multiple times, meaning the effective DPS is much greater than one might assume from the information presented above (which is already high compared to other creatures). The Therizino's sprint speed is comparable to the Giganotosaurs except the Therizino's endurance is better. Therizinosaurus have faster attacking rate while sprinting and it's bite can damage stone structures as well inflict torpor damage and can directly hit the dino rider (similar to the Dimorphodon). The Therizino's base movement speed in water is slightly fast, even without being able to sprint. While it uses both Oxygen and Stamina to swim, and its stamina-endurance while swimming is poor (compared to sprinting on land, at least), it can often make desired swims in such speed its stamina isn't necessary. With use of Stimulants or Recipes to regenerate Stamina, its exceptional base oxygen combined with affinity in Power Harvesting makes the Therizino the best Fish/Prime Meat gatherer in the game. The primary attack (lmb) gathers Wood and Meat in exceptional quantities, as well as lesser (by comparison to c, swipe down) amounts of Thatch and skins (Hide, Chitin, Silk etc.). The attack hits two times with a single click. Each hit deals damage/gathers resources, capable of hitting the same target multiple times or multiple targets. Can perform this attack while moving. They gather Wood almost as efficiently as a Chainsaw, and more efficiently than any other tame. It is recommended to upgrade Weight stats for Wood Gathering as the Therizino can easily reach maximum weight in seconds, and combat stats for Meat/Skinning. This attack will also gather obscene quantities of Rare Mushrooms from the Trees within the Swamp. This attack will destroy Cactus Trees on Scorched Earth, but gathers nothing from them. The secondary attack (rmb, swipe up) functions as a sickle versus bush nodes, and gathers Fibre, Silk and Plant Y Seeds. The attack hits three times with a single click, but takes a few seconds to perform. When using the secondary attack on a tree and pressing the primary attack during the animation it will only gather thatch from the tree. This attack will also harvest from corpses, gathering the same amount of meat and hide as (lmb), but requires multiple attacks to fully harvest the corpse. It is not considered a sickle versus corpses (i.e. it will not gather prime fish from salmon). On some maps, this attack gathers Plant X Seeds, Rare Flowers and Fiber from the Reed Plants at the edge of rivers. On Scorched Earth, this attack also gathers Silk, Plant Y Seeds, Rare Mushrooms and Rare Flowers from Flower Nodes; and Cactus Sap from Cactus Bushes. The tertiary attack (c, swipe down) gathers Berries from bush nodes and Hide/Chitin from corpses. This attack hits once and can be performed while moving. Other secondary resources, such as Pelt and Organic Polymer, are not gathered at all by this attack. When tested, Mammoths and Kairuku give a substantial amount of Hide. On Scorched Earth this attack will also gather Cactus Sap from Cactus Bushes, but in an inferior quantity to the lmb attack. This attack can inflict torpor, directly hit the rider, and damage stone structures. On Extinction the Therizino is a very effective gatherer of Scrap Metal from the corpses of both Enforcers and Defense Units. Invest in delicate harvesting and use the tertiary attack (C attack) to harvest only scrap metal. Be warned that scrap metal is quite heavy so either invest heavily into weight or bring along something such as a Gasbags to haul your heavy metal load back to base. The Therizinosaurus will use its lmb and c attacks autonomously to harvest nearby valid nodes when not in-use by a player (mounted or set to follow). This can be combined with Wander Enabled to have the Therizinosaurus autonomously collect wood, berries and seeds for you. In addition to bonus stats, each time you spend a skill point you will also gain the ability to apply "Harvesting Levels" via the Wheel Menu. The two options are: Delicate Harvesting and Power Harvesting. Delicate: Improves the gathering from Bush/Flower Nodes (rmb/c), hide and chitin (c) and Organic Polymer (rmb). Power: Improves the gathering from Trees (lmb) and Corpses (lmb/rmb), but is surpassed by Delicate for Hide and Chitin in particular. Trees includes Wood, Thatch and Rare Mushrooms. Pelt does not appear to be gathered in any noteworthy quantity by any attack with any upgrade investment. The following table was populated using information from a level 150 that was GMSummoned in single player, and given maximum experience. All skill points were expended in Oxygen, to avoid contaminating the results. Level 5 Diplodocuses were spawned in to test meat/hide; Scorpions for Chitin and Kairuku for Organic Polymer. The Power Therizino when tested against a level 5 Squid gathered so much Raw Fish Meat, Raw Prime Fish Meat and Keratin to reach the stack limit within its inventory, at ~3000 Raw Fish Meat, ~300 Raw Prime Fish Meat and ~750 Keratin, compared to the Delicate's ~400 Raw Fish Meat, ~60 Raw Prime Fish Meat and ~300 Keratin. A similarly levelled Allosaurus gathered twice as much as a Delicate Therizino, implying the squid itself provides an unusually high amount of resources before factoring the Power Therizino's multiplier. These already-good ratings can be improved further with the Harvesting Levels. With 65 bonus levels, one can get up to 4.25x gathering (325% bonus). Be careful when having a tamed Therizinosaurus follow you around. If it hits a tree as a response to an attack and it has a lot of points in Power Harvesting it can unintentionally encumber itself from the sheer amounts of wood it can acquire. This can leave a dismounted survivor vulnerable or cause an unwary survivor leading a large pack of dinosaurs to mistakenly leave it behind. As of v254.0 this issue can be rectified by disabling resource gathering on the Therizinosaurus. Some carnivores that are smaller than the Therizinosaurus appear to ignore it when mounted by a player (such as raptors/carnos). Compared to other "Tranq and Tame" creatures that have a kibble, the Therizinosaurus is among the top of the list for taking the longest to tame (a level 150 still takes over 3 hours to tame on kibble.) Due to their fast torpor drop and the longevity of the tame, this can make domesticating one a daunting task. However the Therizino is very adaptable when it comes to harvesting resources. Since it's also a very powerful battle mount, these qualities mean that having just a few at your disposal can remove the need for several other dinos to be cared for. Therizinosaurus multiensis roughly translates into "Multiple-Sword Reaping Lizard". Majority of players refers the Therizinosaurus informally as “Tickle Monster”,"Longclaws", "Therizino", or "Sid" (Referencing the Sloth character in the film Ice Age). However, there are other "slothlike" creatures in Ark, so therefore the nickname is misleading. Despite the dossier stating the Therizinosaurus as 'Aggressive', the in-game creature is actually 'Territorial' and will only attack the player if they get too close. The dossier mistakenly calls it a “predator”.